This past summer I had the privilege of working as an intern in the Earth and Planetary Sciences department at the American Museum of Natural History (AMNH) — please see my previous blog post. Since then I’ve been lucky enough to continue research with my advisor, Dr. Juliane Gross (Rutgers University, associate of AMNH). Our project was to investigate a new meteorite found in Northwest Africa in 2015 to: 1) confirm its lunar origin and potential grouping, 2) classify the rock, 3) place constraints on its crystallization history and source location, and 4) improve our understanding of unsampled areas of the Moon and expand our knowledge of lunar highland rock types. 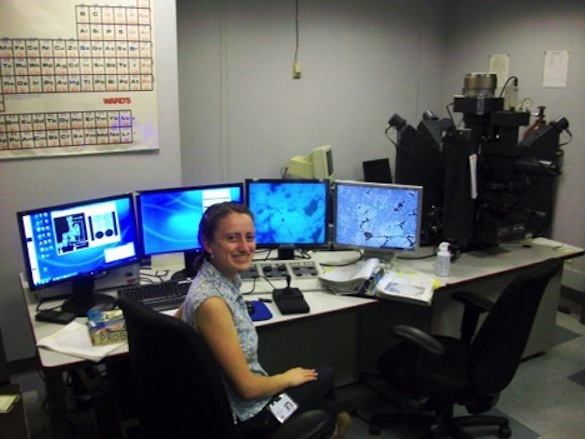 During our research we conducted Electron Probe Micro-Analysis (EPMA) at the AMNH and Laser Ablation Inductively Coupled Plasma Mass Spectrometry (LA-ICP-MS) at the Lamont-Doherty Earth Observatory (LDEO) of Columbia University to obtain geochemical data. We additionally calculated modal mineralogy using qualitative elemental X-ray maps in combination with two computational programs called IDRISI Selva (Eastman, 2012; Fisher, 1936) and XMapTools (MATlab) (Lanari et al., 2013). Using this data set in conjunction with a computational program (Calzada-Diaz et al., 2015), we were able to estimate a few potential source locations on the lunar surface from which the meteorite might have originated. The name and classification for the meteorite was accepted by the Meteoritical Society in late December 2015. Its official name is Northwest Africa 10401 and is one of 60 approved meteorites classified as lunar. We classified the petrography of the rock as an anorthositic troctolite with a granulitic texture, which means it contains mainly plagioclase with a mafic component (i.e., olivine and pyroxene) that has a granular (rounded) texture. Composition of the rock was based on our 6 x12mm thick section of the sample and is composed primarily of Ca-bearing plagioclase (59-65%), with lesser olivine (23-26%), pyroxene (12-15%) (orthopyroxene and clinopyroxene), glass, and accessory phases spinel and metal. We submitted an abstract to the 47th Lunar and Planetary Sciences Conference in March 2016, at which Juliane Gross and I will present our research about this meteorite Northwest Africa 1040. Fig. 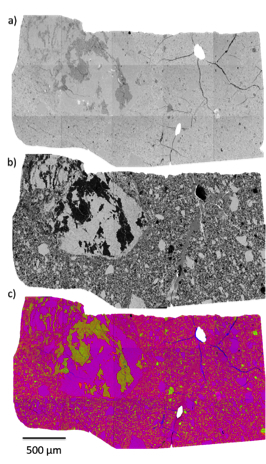 1: Mosaic X-ray elemental maps of the meteorite thick section. a) Si Kα map b) Ca Kα map d) combined RedGreenBlue (RGB-SiFeCa)) map. In general, blue-green = olivine; blue = orthopyroxene; light pink = clinopyroxene; pink = maskelynite (shocked plagioclase); white = epoxy (Hilton et al., 2016). Acknowledgements: A big thank you to Juliane Gross, AMNH, NSF REU Program for Physical Sciences, Abigail Calzada-Diaz for running the computational program for the lunar surface, and Wooster’s excellent Geology professors and staff. Calzada-Diaz, A., Joy, K.H., Crawford, I.A., and Nordheim, T.A. 2015. Constraining the source regions of lunar meteorites using orbital geochemical data. Meteoritics & Planetary Science 50: 214–228. Eastman, J.R., 2012. IDRISI Selva. Clark University, Worcester, MA. Fisher, R.A. 1936. The use of multiple measurements in taxonomic problems. Annals of Eugenics 7: 179-188. Hilton, A., Gross, J., Korotev, R., Calzada-Diaz, A. 2016. Classifying the unknown–the lunar edition: North West Africa 10401 a new type of the Mg-suite rock? 47th Lunar and Planetary Science Conference. Abstract.